*CLOSED* DVD Review: #ToothFairy2 PLUS Giveaway! My family loves a good movie that we can all enjoy watching together. 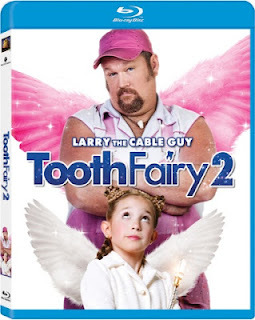 In this very cute sequel to the 20th Century FOX Home Entertainment 2010 movie, "Tooth Fairy" with Dwyane "The Rock" Johnson (*insert long swoon here*) and the fabulous Ashley Judd, "Tooth Fairy 2" stars comedian Larry the Cable Guy. Larry plays a goofball who makes the mistake of telling a child that the tooth fairy doesn't exist. He learns the hard way that they do exist and there's a bunch of them! The fairies impose a punishment upon Larry and he has to work for them, collecting teeth of children that he coincidentally knows. Larry doesn't have the power to control when he turns into the tooth fairy and it puts in some silly situations. Larry Guthrie (Larry the Cable Guy) is a fun-loving dreamer with a serious mission: win back the love of his life before she makes a terrible mistake and marries the wrong man! In his attempt to get back on his long lost love’s good side, Larry visits the school where she works and make’s a horrible mistake… He accidentally tells a child that the Tooth Fairy is just a myth. Crushing the child’s dreams sets off a chain of events that are far more than Larry bargained for including being “sentenced” to become a Tooth Fairy or face having his memories erased for good…PLUS losing any chance of getting back the girl of his dreams! Larry is brought before a 500-year-old Tooth Fairy stuck in a 10-year-old girl’s body (played by newcomer Brady Reiter) for sentencing. The Tooth Fairy demands that Larry make retribution by temporarily serving as a Tooth Fairy and proving that Tooth Fairies really do exist. His mission? Larry must collect 10 teeth in 10 days. With his orders in hand, Larry embarks on a journey to prove the existence of Tooth Fairies and to win back the love of his life. My Thoughts: At least in the first Tooth Fairy, Dwayne got to sport a blue tooth fairy uniform after being sentenced to collect teeth. No such luck for Larry. His punishment includes a pink tutu and ballet slipper uniform. He eventually bargains to coveralls but it's still pink for him, which makes it all the more funnier. I think we laughed every time he transformed. Me and my husband found the Tooth Fairy 2 very entertaining, a little predictable in some parts but a great family movie. I personally love Larry the Cable Guy's films and find him hilarious in this one as well. People of all ages will enjoy this film. • Why Do I Lose My Baby Teeth? Disclosure: I was provided a copy of this movie for the purpose of review. All opinions included in this post are solely mine. GIVAWAY - One (1) reader will win a DVD copy of Tooth Fairy 2. To enter, follow the instructions in the form below.